It really worked! 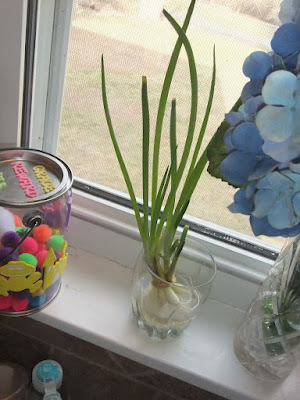 I did nothing, except add water, and now I have fresh green onions whenever I need them! This got me thinking about how I’d like to try to grow some other vegetables and herbs this summer. The only problem is that I know nothing about having a garden. I decided to start researching starting a garden. I found this great website, it’s called Sprout Robot. You enter in your zip code and it sends you weekly emails telling you what seeds to plant each week. I haven’t started anything yet, but I’m hoping the weather will stay warm and in the next few weeks I hope to start planting! If anyone has any gardening advice I’d love to hear it! Square Foot gardening and Lasagna gardening, I have heard, are both great books! Well done with the onion. Its looking really healthy. Its amazing how little space is needed to grow herbs and vegetables. And its so much more satisfying growing your own veg. Much healthier too. Keep up the good work. Herbs are a wonderful way to enjoy the smells and tastes of gardening. They take very little space, grow quickly for the kids to appreciate and save bundles.